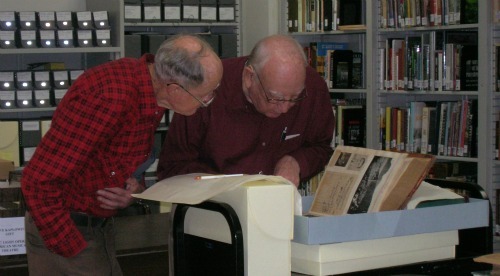 Will Jensby, left, serves as our memory bridge to the Perham Collection’s precursor, the Foothills Electronics Museum. A Nebraska native, Will served as an Air Force radar observer during the Korean War before completing his electrical engineering degree at the University of Nebraska. Following several years with Lockheed, he returned to operate the family farm near Davenport. 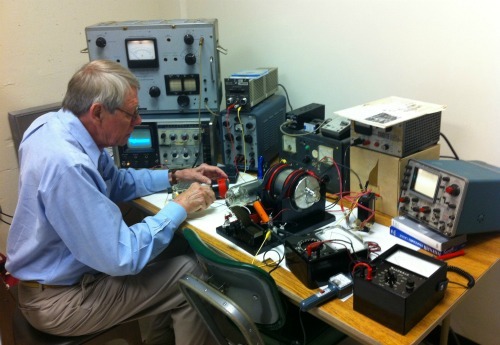 A ham operator since 1951 (W0EOM) and long interested in early radio, he began his extensive radio collection there in the mid-1970s, ranking among the top ten collectors. He rejoined Lockheed in 1982, where he worked on the Millstar space satellite program. Will became a member of the Perham Foundation board of directors in the mid-1980’s, later serving as its vice-president during its transition from Foothill College to “a museum in a box.” He was instrumental in helping with the 2003 transition to History San Jose, and with getting started with the cataloging of more than 2,500 objects. Will remains especially interested in early radio, as well as amateur microwave radio. 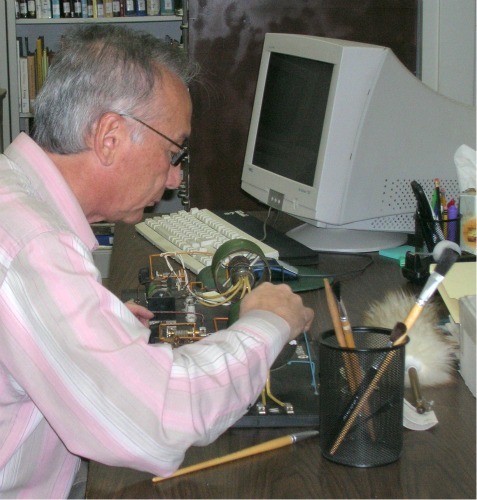 He is the author of articles for the Antique Wireless Association, Tube Collectors Association and QST. A version of his latest article, “Heintz and Kaufman Gridless Gammatrons in the Perham Collection of Early Electronics,” was published in TCA Special Publication No. 20 (December 2011). A longer version, with additional illustrations by Bjorn Forsberg and photographs by Bill Durfey, will be available online in the near future. Will is currently working on research about early radio operators Howard and Lydon Seefred, as well as documenting apparatus relating to Lee de Forest and Ralph Heintz in the collection. 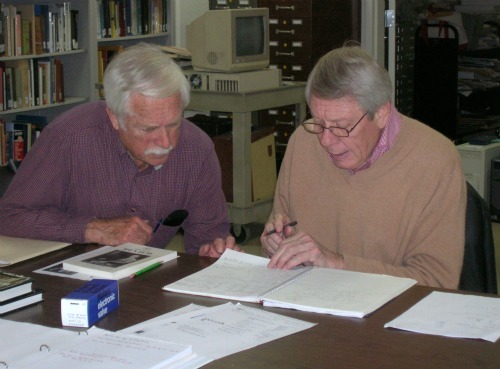 Ralph Simpson, right, a University of Idaho graduate in mathematics and statistics, joined IBM as a systems engineer in the late 1970s. Specializing in networking, he later moved to CISCO in 1994, retiring in 2009. He joined the Perham volunteers in 2011. He began his collection of cipher machines and early networking devices (public key encryption) in 2000 with a 1941 Enigma machine. Important items from his collection can be seen at http://www.ciphermachines.com. Ralph is working with the Leo Jones collection of papers, documents and apparatus. Jones, a pioneer in post-war surveillance equipment (and countermeasures) for law enforcement, was the technical advisor and inspiration for Gene Hackman’s lead character in the Francis Ford Coppola film, “The Conversation” (1974). Ralph also plays an important role with his camera, documenting apparatus in the Perham Collection for History San Jose’s online catalog and for the Perham website. Stu Hansen, below, electrical engineer and ham operator, calls himself “a hardware kind of guy.” He began working on the Perham Collection of Early Electronics in 2003 when it arrived at History San Jose, sorting through 74 pallets of vacuum tubes. After receiving his B.S. from CSU Los Angeles (1964) and graduate study at San Jose State, Stu worked on analytical instrumentation at Varian, Hewlett-Packard and Agilent, with an early stint with the Jet Propulsion Laboratory (including JPL tracking stations in South Africa and Australia) during the late 1960s. A ham operator since 1951 (W6QAJ), and a member of the Stanford Amateur Radio Club, he remains especially interested in early radio, transmission tubes and transmitters, and “things that glow at night.” He is currently researching the work of James F. Lee, of Palo Alto and Menlo Park, inventor of the multi-focus X-Ray tube (1931). Bjorn Forsberg trained in Sweden as an electrical engineer and worked for 7 years on satellite parts. He came to California in 1970 to work at TRW, later spending 30 years in the satellite spacecraft industry with Ford Aerospace and Loral. Bjorn became a ham operator at age 18 in Sweden (SM5UR), and is an avid collector of antique radios, primarily those used during World War I, and early radio tubes. In 1990, he helped move the Foothill Electronics Museum into storage, but returned to the Perham Collection with its arrival at HSJ in 2003. After working with Will Jensby to document the collection’s unusual set of Heintz and Kaufman experimental gammatrons, Bjorn has been working with Perham’s seven unique breadboards used by Ralph Heinz in his 1936 patent suit defense (RCA v. Heintz), which Heintz later gave to Douglas Perham. He is also working with three rare Farnsworth multipliers. And our special thanks to other Perham Collection volunteers, past and present, including Bill Durfey, John Cain, and Charles Ragsdale.